As a sub, I had no preconceptions of what touring would be like, having nothing of this scope to compare it to. Over the last 24 hours, I've heard from every musician I've talked to that this tour is the exception in nearly every way possible. As one put it, "Usually as soon as we get there we take off in all directions, like billiard balls." The only expectation would be for you to show up ready to play at rehearsals and concerts; other than that, you were on your own as much as you wanted to be. This trip is more like a combination of high school band trip, organized cruise, and political science seminar. We are moving in groups for every planned activity — and there are many. Yesterday there were welcome ceremonies, performances from Cuban musical ensembles, speeches and receptions. This morning, we were herded onto buses and taken to what they call "Music City," the large campus that houses the main music high school and university in Havana. 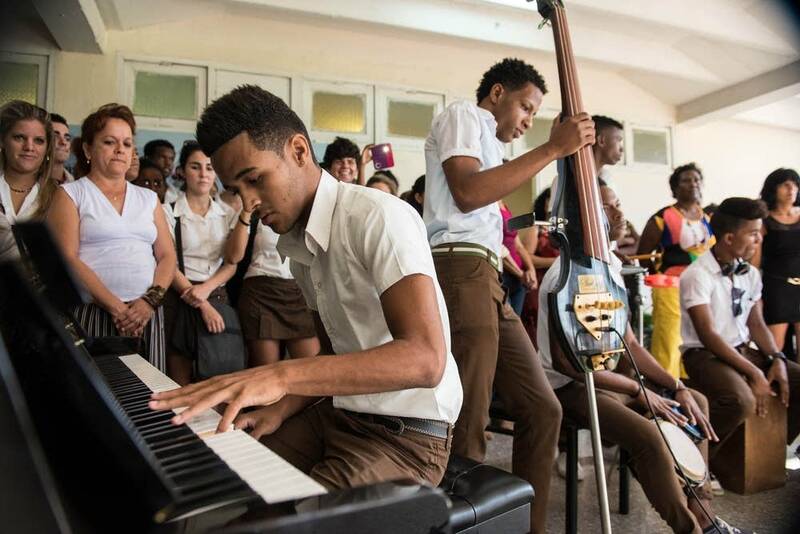 We were greeted by a student performance of traditional Cuban music in a courtyard of the school, then split off into groups in various classrooms. Many students, teachers, and performers were squeezed into the small rooms. Kids were sitting on floors, chairs, and laps, standing in corners and peering above shoulders in doorways, fanning themselves in the stagnant heat as their fellow classmates bravely volunteered to play in the improvised master-class. Several of their teachers spoke some English and helped to translate the lessons. One young bassoonist worked with Chris Marshall on a transcription of a Bach flute sonata. Greg Williams and saxophonist Jim Romain also worked with individual students, and Adam Kuenzel spent some time with a flute quartet before playing Debussy's Syrinx for the rapt audience. The level of musicianship at the school was very high in spite of the difficulties in obtaining equipment such as reeds, mouthpieces, and even music here, and to a person everyone remarked on this fact afterwards. Three chamber music ensembles then gave a casual performance in another courtyard, while I finally found an opportunity to speak a little Spanish with Alina, a bassoonist who was at the school today. She is a professional musician here in Havana who plays with the opera and ballet orchestra, as well as with a woodwind quintet. The monthly salary for an orchestral musician here: $35. Perhaps I should complain less. We had a long conversation about music, the state of the schools, and the lives of professional musicians in Cuba and in the United States, and I'm pretty sure I got at least 30% of it. Alina invited me to her quintet performance this Saturday, and showed me her ticket for our concert that night with great excitement. We ended by trading e-mail and mailing addresses, with great plans for cultural exchanges in the future. The language of music may indeed be universal, but a little Spanish never hurts.